Participant : Graduate students of Chemistry Track and others interested in Chemistry. The 2017 Chemistry Seminars will be held at UNIST, every Tuesday from March 7th to June 13rd, 2017. 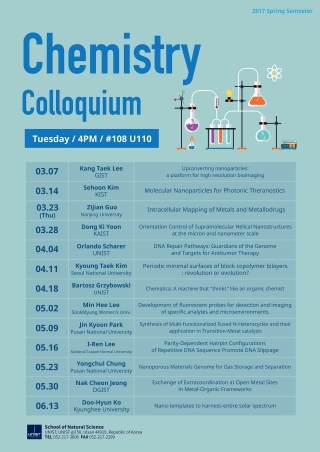 The 13th lecturer of this year’s Chemistry Colloquium is Prof. Doo-Hyun Ko from Kyunghee University, presenting “Nano-templates to harness entire solar spectrum”.